TurboTax lives up to its name by finding and maximizing your deductions. It guides you step-by-step through mortgage interest, charitable contributions, education, medical expenses, and more so you won't miss any potential deductions. 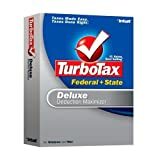 This program also shows you how to qualify for deductions, looks for deduction opportunities, and tracks how much..
Tax time again... TurboTax Deluxe 2004 Win/Mac - $29 after $10 rebate. Also get Quicken 2005 Basic for Free (after rebate) and TurboTax State for Free (after rebate). Rebates included in TurboTax Deluxe box. Also, clickthrough to see more Tax Season Offers: Get Up to $489.99 Back!